Your preparation for fall and winter travel to Mexico includes quite a bit of research. However, the time for researching information guides related to communities, attractions, rentals, or other points of interest will culminate in a decision as you map your route and pack your bags. You won’t want to forget basics like updating your passport and securing Mexico insurance for Canadians. Reliable Mexican insurance for Canadians won’t need to be effective until you reach the Mexican border, but you can make adjustments to your Mexican auto insurance for Canadians online if your timing changes a bit. As you read about various attractions in the area you will visit, you may also want to check out attractions that you might encounter enroute. In the U.S., Route 89 offers you access to several national parks. As you get into Mexico, you can check for an online guide to each major city on your route. The more cities and states you visit, the more important it is to pay attention to the financial information and guides related to your Mexico insurance for Canadians for Canadians. Your Mexico insurance for Canadians will vary with liability limit requirements from one state to another. This is due to Mexico’s labor law, which dictates survivor payments to those left behind if their Mexican family member is killed in a third-party accident. Although it is a labor law, this is also effective for auto accidents, including those in which foreigners are considered to be at fault. Your multi-state trip should be protected by high-limit Mexican insurance for Canadians to ensure that your obligations will be satisfied in such a scenario. If you plan to take your time on the road, it is wise to estimate your border crossing date into Mexico. If you find that you will arrive early, be sure to update your Mexican auto insurance for Canadians before you reach the border. You can also make such an adjustment if you will cross a bit later, but this change is not as critical. As long as your Mexican insurance for Canadians is effective when you cross, you should be fine. 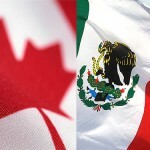 Mexico Insurance for Canadians through MexicanInsuranceStore.com includes roadside assistance throughout all of the Republic of Mexico. We do not charge extra for this. Choosing a 3 to 6-month Mexican car insurance policy is the most economical option. Being a Canadian, you have to do it because American or Canadian insurance is normally not valid when you reach Mexico. Have you tried driving around Mexico and go shopping? Well, seeing those crafted items and beautiful souvenirs will excite you more. A small budget can already buy lots of items. Mexican insurance coverage is a must in Mexico. It is needed to cross the border if you come from Canada the US or other countries.